TMD's Nick Pasculli Receives Ag Tech Innovator Award - The Marketing Department, Inc.
Nick Pasculli was awarded the Ag Tech Innovator Award at the 2017 Salinas Valley Ag Tech Summit on Hartnell’s Alisal Campus. 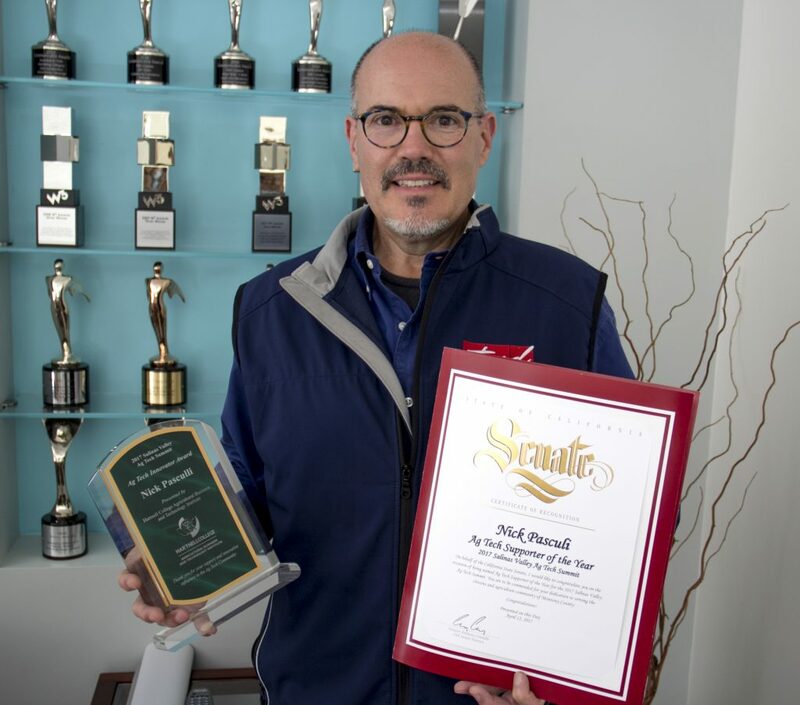 The award, presented by the Hartnell College Agriculture Business and Technology Institute, was to honor Pasculli’s continued support of the ag industry, as well as his success in cultivating a deepening relationship between technology and agriculture. The event is hosted by the Agricultural Business and Technology Institute at Hartnell College in collaboration with the Monterey Bay Chapter of the CA Association of Pest Control Advisors (CAPCA). The summit features a wide variety of speakers and panel presentations on the topics of crop protection, automation, harvest, innovation, worker safety and regulations. There are also displays, demonstrations and breakout sessions. Admission to this yearly event is free and proceeds benefit the Hartnell College Alisal Campus. Sam Spadoni was on-hand to accept the award on Pasculli’s behalf. The award was presented by California State Treasurer John Chiang, former mayor and current executive director of the Western Growers Center for Innovation and Technology Dennis Donohue, owner of Converted Organics and sitting Salinas City Council Member Steve McShane, and Dr. Susan Pheasant, Director of the Hartnell College Agriculture Business and Technology Institute. Nick Pasculli, in addition to being the founder and president of TMD Creative, is also an instructor at Hartnell College in ag business, marketing, and economics. Additionally, he sits on numerous industry and community boards, including the Hartnell College Foundation board. Congrats Nick! Copyright © 2015 The Marketing Department, Inc. All rights reserved. A BBB Accredited business since 11/01/2003.